Why many people with sleep apnea have diabetes? Researchers have often found an association between sleep apnea and diabetes. This fact is not surprising, because many patients with severe obstructive apnea (OSA) also have diabetes. There is another interesting fact related to this subject: several studies have shown an increased prevalence of sleep apnea and other sleep disorders in patients with diabetes mellitus type 2. This means that people with diabetes may develop OSA. Let's see how diabetes and sleep apnea are so often found together in so many patients. To understand why sleep apnea and diabetes have a common link, you may want to know what is diabetes, especially the second type, which is very common in sleep apnea patients. 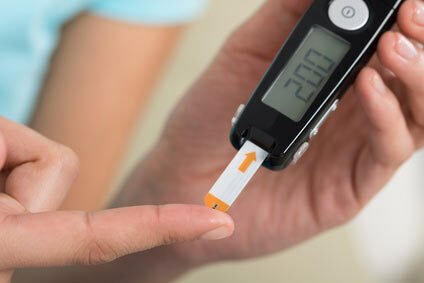 Why Sleep Apnea is Linked with Diabetes? glucose homeostasis - the organism's tendency to maintain the balance of insulin and glucagon in order to keep a healthy blood glucose level. The disruption of glucose homeostatis is mostly found in people with diabetes. insulin sensitivity - the sensitivity to insulin is decreased. This means that you'll need larger amounts of insulin to keep the blood glucose stable. If the pancreas cannot produce larger amounts of insulin, you'll need injections. A low sensitivity to insulin is mostly common in patients with type 2 diabetes. risk of obesity and diabetes - the risk is increased for people who have many disruptions during sleep, such as apnea episodes. From my personal experience, I realized that many of my work colleagues who work in night shifts have type 2 diabetes. They are the one who can't get a good quality of sleep, and also have many stressful situations during work. Not to mention that my father got sick when he worked in shifts. He had problems with a normal sleep, he was snoring, and now sleep apnea and diabetes...I've never imagined that sleep deprivation can be so dangerous. Why Sleep Loss is a Risk Factor for Diabetes? Sleep complaints are common in adult diabetics. The diabetic patients have higher rates of daytime sleepiness, insomnia, nocturnia, and restless leg syndrome. Glucose intolerance, which is a precursor to diabetes, is manifested by glucose levels rising higher than normal and for a longer period after an intravenous dose of glucose. Researchers have found that stimulating repeatedly the sympathetic nervouse system, a person can develop in time glucose intolerance. The published results about their discovery can be found in this study. Stopping breathing during sleep can stimulate the sympathetic nervous system, as mentioned in thisresearch study. This leads to release of cortisol and other vasoactive intermediates, which may mediate the development of glucose intolerance, insulin resistance, and, ultimately, type II diabetes. A sleep study has shown that adults with five hours of sleep or less were 2 times more likely to have diabetes, compared with those who slept seven or eight hours per night. Adults with sleep times of nine hours or more also showed these side effects. Bottom line... It's very clear for researchers that sleep apnea and diabetes type 2 are found often together in many people.Although studies suggest the link between diabetes type 2 and sleep apnea, the question remains whether diabetes is a cause and/or consequence of sleep disordered breathing.